Samir has knowledge and experience in all aspects of private client work. Sam worked in local government for more than a decade before deciding to have a change in career. He completed his training at Steeles Law and qualified into their Private Client department in 2009. He joined Gregsons in 2010 as an Assistant Solicitor. Law Society, Society of Trust and Estates Practitioners (STEP), Private Client Section of the Law Society. 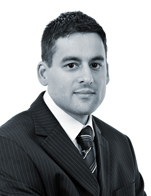 Sam studied mathematics BSc and then completed the Graduate Diploma in Legal Studies before qualifying as a solicitor.